An overwhelming heat is this sauce's downfall, as it comes in so quickly and so strongly that any enjoyment all the other good things going on here are incredibly fleeting. After working as a financial planner, Sharone Hakman decided to give his true love of cooking a shot. In 2010, this led him to an appearance on Fox's MasterChef, where he wowed the judges with a barbecue sauce that they declared to be his "secret weapon." This led Sharone to put his sauce to the test again in a cookout for 500 Marines at Camp Pendleton, and then at a gourmet burger truck stop challenge. 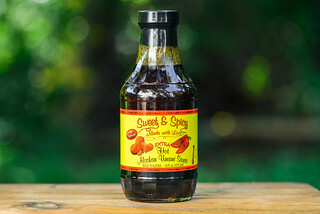 When the sauce continued to be widely praised, he began bottling it, along with two other flavors. I saw this line at my local grocery and was attracted to stylish packaging, so picked up a bottle of the one that spoke the most to me—Habanero Pineapple. 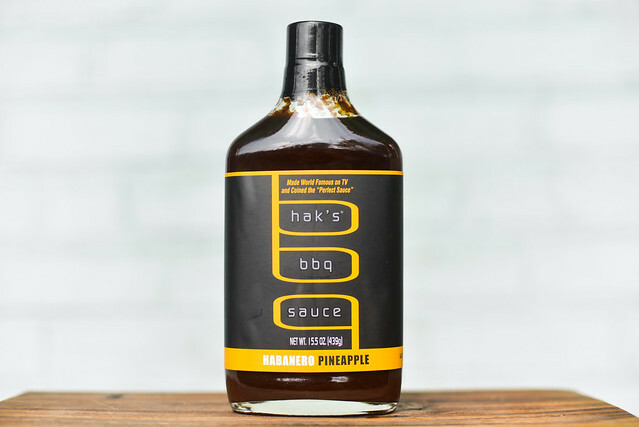 The molasses heavy aroma of Hak's Habanero Pineapple comes with only a mild sweetness. Instead of sugar, an acidic tomato base gives it a deepness that gains a little extra fruitiness, which I assume is by way of pineapple. The upfront tartness is enhanced by vinegar, which combines with hot peppers to create a mild nose tingle. Despite the habanero pineapple name, both of those elements a fairly nondescript in the aroma, instead coming through as fruitiness and heat without the distinctly defining characteristics of each. This dark maroon, opaque sauce runs just north of medium on the thickness scale. It's thick with a texture look that has some large chunks of presumably veggies or fruit. Through its dark color, it's hard to make out any spices, although a thin sheen of sauce on the edge of my glass bowl showed that they were there. From a suspended spoon, the sauce falls in a quick, uneven chunky pour, dropping in a few big globs, then ending with the lower half the spoon heavily coated in the sauce and only a thin layer left clinging to the upper half. 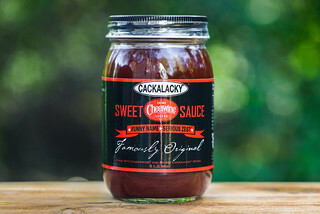 The sauce starts with a slightly sweet molasses flavor. The sweetness is light and is quickly taken over by a wave of acidity. During this fleeting moment of balance between sweet and tangy, the tomato base comes through along with a very distinct pineapple fruitiness. There isn't much time to savor that flavor as the heat hits next, and it's in it to win it. As soon as the peppers make their entrance, they shove everyone else off the stage. The heat doesn't have the fruitiness I expect from habanero, but it sure has the mouth scorching power. It takes only a second or so for the heat to transform a little tongue tingle into a 5-alarm mouth fire—it even an elicited a hiccup reaction, which only the hottest sauces are able to do. Not surprisingly, a lingering pepper burn is what defines the aftertaste, along with just a slight pungent smokiness. On the grill, the sauce was seemingly baking down well on the chicken, but then rubbed off on the tongs as turned and moved the leg around. This required me to add an extra brushing at the end to give the chicken an even coating, leaving it with a dark brown shell that retained the chunky appearance. The flavor suffered a similar suboptimal fate. 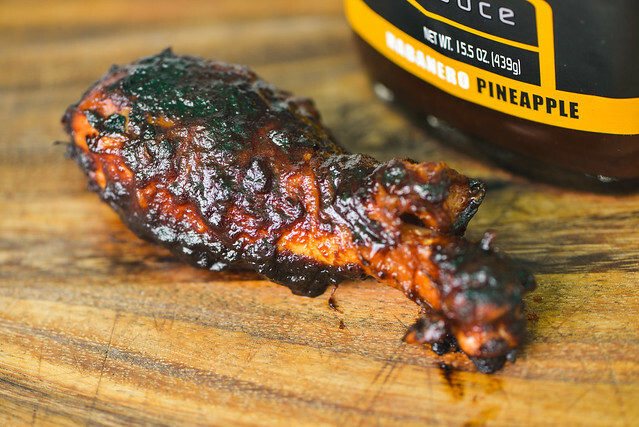 The sauce that did keep clinging to the chicken leg burnt slightly over direct heat, giving the chicken a charred and acrid flavor. The subtly the pineapple had out of the jar was nonexistent, reducing the depth of the sauce. A mild molasses sweetness remained though, which found a better balance with the heat that was still hot, but no longer overwhelmingly so. It was just enough to leave my lips tingling, but not enough to wash out the burnt molasses flavor. 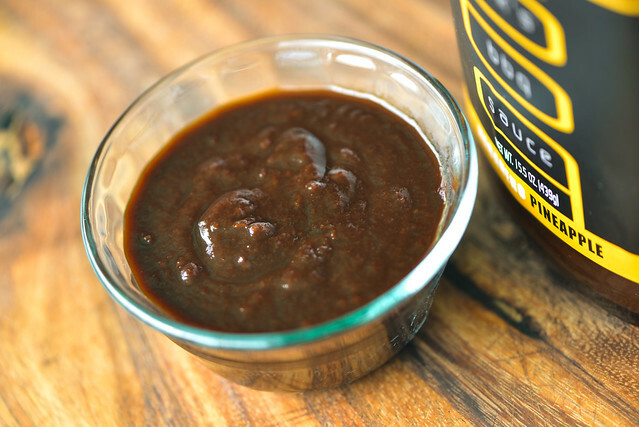 After doing some research while writing up this review, it seems people really love the original Hak's Chipotle Bourbon sauce, so maybe I started with the wrong bottle. I couldn't find much love for this sauce that had a heat so hot that any enjoyment of the other flavors was fleeting. 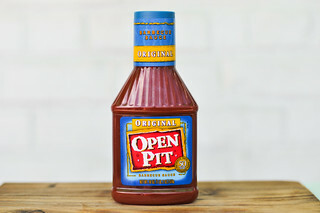 I could taste that the ingredients were fresh, giving the sauce a more natural, unprocessed feel. That was enough to bump is up a point, but not enough to overcome its shortfalls that would make it too hot to use on most things out of the jar, and not a great choice on the grill due to the way its charring ended up tasting burnt rather than pockets of great caramelization, like many sauce do. It lends itself better to 3/2/1 ribs than chicken, although I do add quite a bit of my own, I tend to use this as a base in place of mustard.